This is How I Feel About....Thrift Stores. Link up!! So, I'm gonna start a new thing. I'm going to tell you how I feel about things. I don't know if anyone will care, but I figured I'd share. AND you should be super cool and share back with me how you feel about anything in my link up below!! I feel like this is taboo for the crafty/deal seeking/bloggy world. BUT I AM!!! Everyone always blogs about all their great thrifty finds and I'm so jealous. I don't have thrift skills. I have anti-skills. 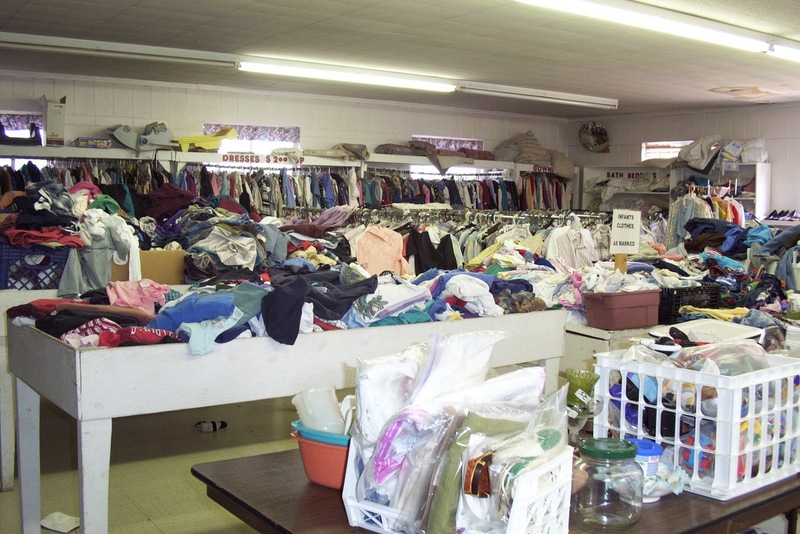 When I walk into a thrift store I feel a little vomit creep up in the back of my throat, that's how much anti-skill I have (ok maybe that only happened once...or twice...) Why am I so anti-thrift?? Here's why. 1. Thrift stores stink. You can't deny it. It always smells like moth balls/grandmother/BO/all rolled into one. It hits me right as I enter the door and I cannot get passed the scent. 2. They are overwhelming. 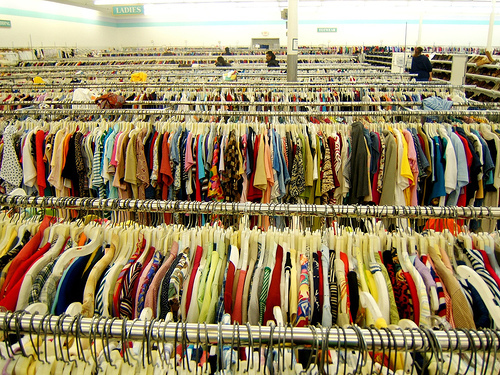 They are filled of rows and rows of used clothes and there may be some hidden gems in there, but there is so much searching through overalls, 80s garb and used underwear (seriously, WHO does that???) required to find them! 3. Thrift stores are always so messy. I don't like digging through things. And yes, that is a thong hanging out in the picture to the right. Yikes. So what about you? Have anything you'd like to share your feelings on? It doesn't have to be thrift stores (but it could :) ) Be cool and link up and I'll share some highlights from the post next Monday when I do another post. If you throw in my blog button in your post, I'd love you forever. But if not, I'll still love you for half of forever for just linking up. And that's not half bad if you ask me. I think one thing is it depends on where you live. I use to live in Tennessee and I use to LOVE thrifting. There was a church thrift store that I would always find treasures at. It was especially clean and neat which made shopping easy. I now live in Ohio and find thrifting to be a much greater challenge. Pretty much the only store we have here is the Goodwill and honestly I think they are a little overpriced for used clothes. I mean 5 dollars for a used shirt? You can buy a brand new one for not much more at places like F21 and stuff so it kinda defeats the purpose of looking for cheap things( which is mostly the point). But, I think thrifting is one of those things you either love or don't. To me its all about the thrill of finding something for nothing. Turning somebody's trash into treasure. Also, in a time where everything you buy is meant to be thrown away, I feel like recycling and reusing is a responsible way to cut back on solid textile waste. Give it a try and go in with an open mind. Also I think you should try to be less critical of judging others, especially based on weight and physical characteristics. People are people and I think the majority of people do the best with what they have so I find it somewhat offensive that you said you feel uncomfortable shopping with "them". Honestly, as somebody who tries to find the beauty in all people, I feel that this attitude is the problem with our social inequality today. Clothes are just clothes, and I think the most important thing is to feel comfortable with who you are no matter what or where you are. I'm pretty creeped out by this as well. I can only get stuff that can e seriously sanitized. And I have only found about 2 good things ever. I don't know how people do it. I just went to the trift store today and actually came away with some treasures, and thankfully no weirdos. But I too, feel dirty after I leave. my hands feel so grosse. 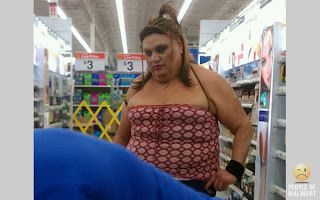 There are some Wal-marts I avoid for this reason too, and will only go to the new ones. Ha ha. Speaking of The People of Wal-mart, have you heard this rap? Oh heavens I'm sitting here laughing in agreement! I always have such high hopes but come away totally skeeved and wanting a shower. You pretty much said everything I feel about thrift stores here in my country. I tried going once... and within 5 minutes of entering, my skin started to itch. Literally. And I couldn't breath. And that was the last time I went. I envy my friends who do go, and end up finding designer bags (which they pay to have restored, but the cost of having them restored is still cheaper than buying a new bag), designer clothes, etc. I have no idea how they find anything in thrift stores. 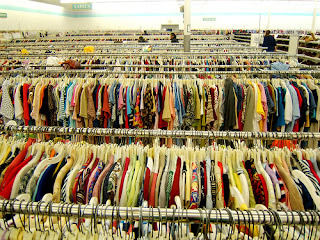 i can identify with your unease...but as a girl who likes expensive and unique clothing, the only way to indulge my chic side is by thrifting...i do stay away from the icky stores though...we have an awesome and clean sal val that is my favorite place to shop. Im excited to be a new follower and I'd so love for you to follow me! Hi Rebecca! Just wanted to stop by and say "thank you" for visiting my blog. Your blog makes me smile! :) You are so creative!! Ok, you're a bit right about some of this (and funny as well)! But I do have to admit I'm a thrift store junky. I've just found so many unique, cool things that I find it a bit addictive. And it does totally depend on the store. Btw, I also added a link to a post I did about why I love thrift stores. 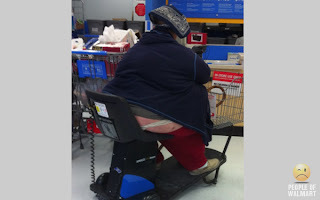 And I have to say that second People of Walmart photo makes me want to throw up!!! Sorry - I think I fixed the link - trying to do too many things at one time. I feel exactly the same way, and I would add (don't judge) that I feel like people look at me and are wondering why I am there, like I shouldn't be there because I could afford to shop elsewhere.